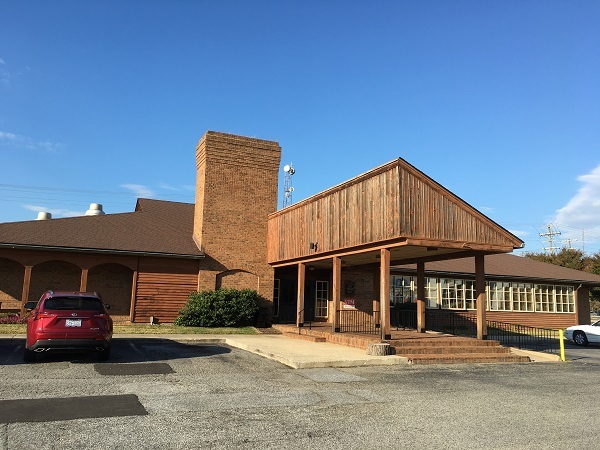 Stamey’s Barbecue, Greensboro NC (Marie’s take) – Marie, Let's Eat! I enjoyed my visit to this restaurant in the spring so much that I couldn’t wait for Marie to try it. Here’s what she thought. We stopped at Stamey’s near the end of our first day, and although I’m usually not expected to keep up with Grant on one of these eat-a-thons, for some reason I had even less capacity than usual. So I didn’t do true justice to the portion provided, which is a shame. Grant had been waiting for months to share this particular meal with me. It’s a mark of a good relationship when you find something delightful and your first thought (after WOW! of course) is “Gee, I wonder what s/he’d think of this?” Seriously, we have the best hobby. The meat is smoky. I didn’t feel the need to add much sauce (they call it “dip”). It’s a thin, red, peppery sauce that doesn’t need much to bring out the flavor; you don’t want to drown this meat. I barely nibbled the hush puppies as they had to compete for an extremely limited interior space. The red slaw wasn’t my cup of tea. Grant and I also differ in our tastes for slaw – he likes hot slaw, and I don’t. He is bored by mayo slaw and I find it perfectly acceptable (especially on a hot dog). We do intersect on mustard slaw – I think we both like that about equally. 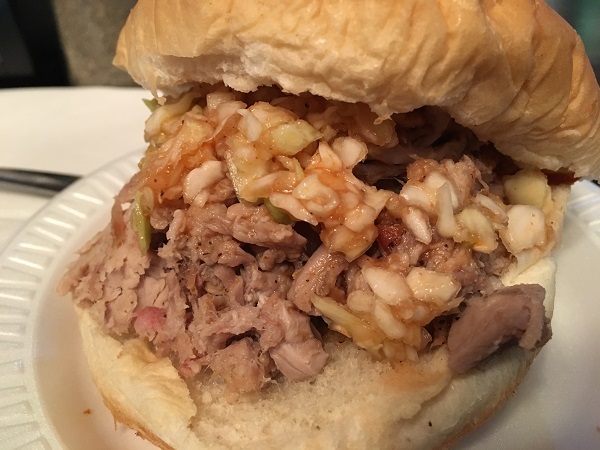 And so forth…he also likes the tradition of putting slaw on the meat. Since I am much pickier about the stuff than he is, I always ask for it on the side. Every once in a long while I’ll eat a bit of meat and slaw together, though. The restaurant by the Coliseum originally opened as a drive-through in 1953, and was rebuilt in 1980 as an eat-in restaurant, but the original pit was kept intact. Warner Stamey, who founded the restaurant, reportedly took great pride in that pit. He’d learned his craft from Lexington pitmasters Jess Swicegood and Sid Weaver (as mentioned in Grant’s original piece, those two are the inspiration from whom most area barbecue traditions have grown). He built on the knowledge gained from them, tweaking the process through the years. 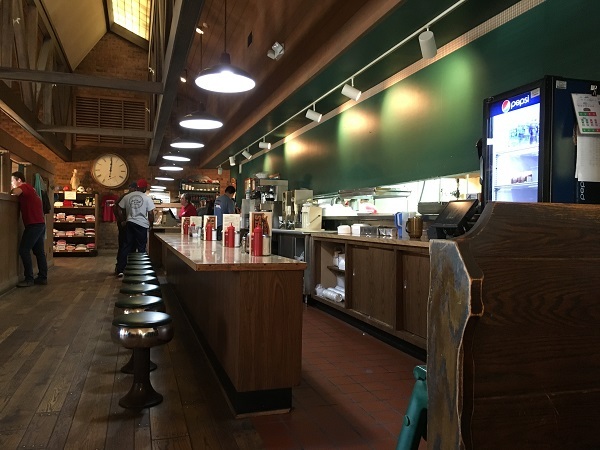 Stamey bought Swicegood’s in Lexington in 1938, renamed it for himself, and then opened the first location in Greensboro in 1953, on High Point Road. The second generation added another location on Battleground Avenue, and the third generation runs the business now. It’s always a pleasure to see a business that so beloved by the community it serves stay in the family. It’s even better when it follows in the founder’s tradition from one generation to the next, and continues to earn prizes. This year Stamey’s won first place for best BBQ sandwich in North Carolina in a little event co-sponsored by USA Today, making it even more urgent that you head over if you are anywhere nearby, passing through the area, or if you are inspired by our crazy shenanigans and decide to go on an overnight trip to have lunch! Incidentally, I found a link to a recipe that purports to be Stamey’s dip. I’m not totally sure about its authenticity, but here it is in case you care to give it a try. Incidentally, Grant keeps trying to get me to shake up the sauce/dip in places like these to liberate more of the pepper onto my meat. We like different kinds of heat, too. I’m perfectly content eating pizza or drinking tea that is hot enough to take the top layer of skin off the inside of my mouth. Grant, on the other hand, is happier the the longer a meal leaves his mouth tingling. Looking at the ingredients (three kinds of pepper!) you can see why I used this sparingly while Grant loved the stuff to pieces. Combine the ketchup, vinegar, sugar, salt, black pepper, red pepper flakes, ground red pepper and 1 quart of water in a large pot and bring to a boil, stirring occasionally. Serve hot with cooked meat. 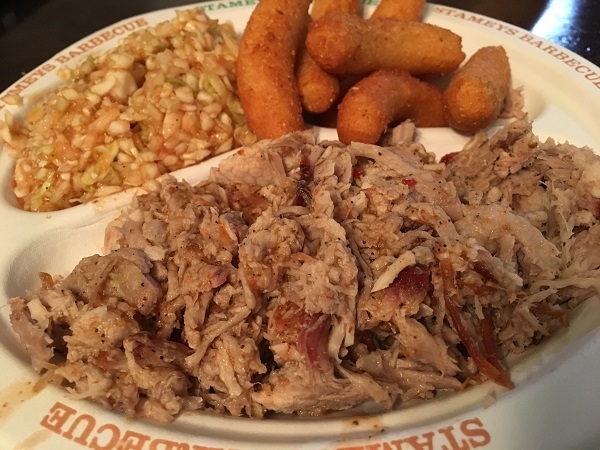 Posted on November 21, 2016 November 21, 2016 by Grant G.Posted in barbecue, marie writes, north carolina, piedmont triadTagged barbecue, greensboro, marie writes, north carolina, piedmont triad. Wow that looks awesome. Here it is close to lunch time and I am starving wishing I could taste that BBQ. We wish you could too! It’s well worth a visit.